I’ve had a love of trains since my childhood. My father worked on a small commuter rail line running between Chicago and South Bend, Indiana, so I literally grew up riding the rails. 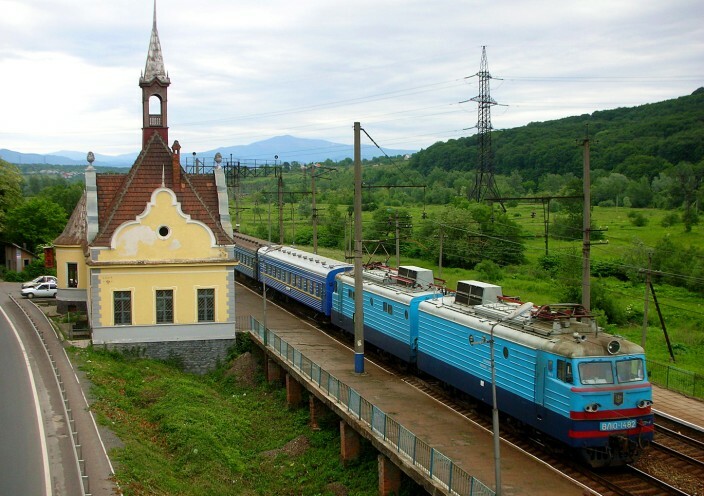 As with everything else, some of the details are a little different in Ukraine, but the essential allure and romance of rail travel remains the same. On the longer trips – anything over four or five hours – there are three different classes of passenger cars. The most expensive is a two passenger sleeping compartment called luxe, priced well beyond the reach of all but the most wealthy Ukrainians, and not available on every train route. The middle ground is a four bed private compartment, two up and two down, known as coupe. For me, this is the way to go. It affords a measure of privacy not found in the third and cheapest method called plascart. 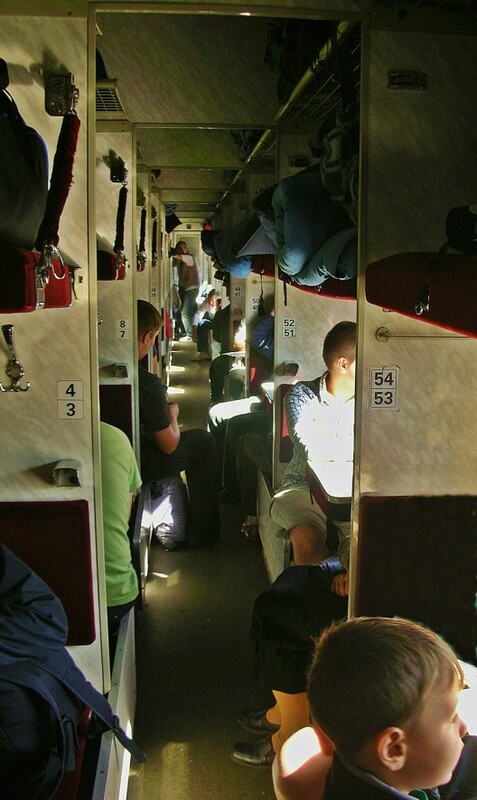 The vast majority of Ukrainians do their train travel in plascart but unless you are someone who likes sleeping in an open hostel-like environment with forty-seven other people and you’re extremely hard of smelling, I wouldn’t recommend it. Certainly it makes for the most interesting and perhaps authentic travel experience, but I’ve tried it twice and all I’ve gained is a major case of sleep deprivation. My first experience riding in the plascart section came a couple of years ago. 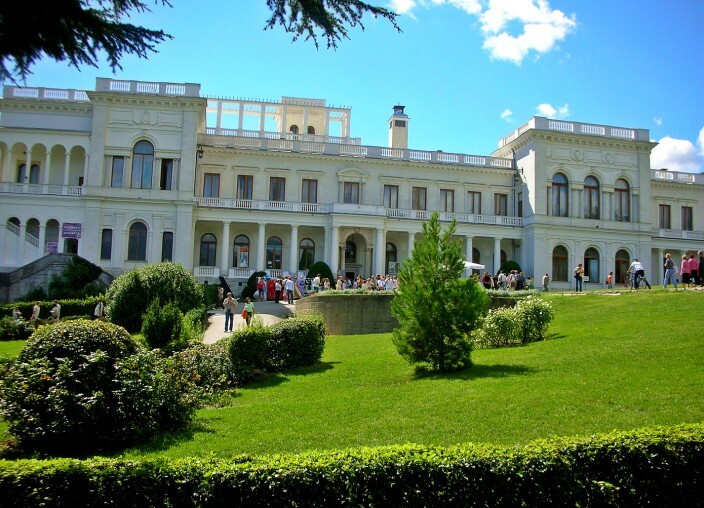 We left from Simferopol station in Crimea heading north to Kyiv, an overnight trip of about twelve hours. Previously I’d ridden only in the coupe cars. With four people in a compartment, coupe is a bit close but not uncomfortably so. People often share food, drink, and conversation with their one-night roommates, or sometimes not so much. It simply depends on the individuals you end up sharing space with. Plascart is an entirely different animal. Fifty-four people share a no doors sleeping arrangement, with each section containing four bunks on one side of the aisleway, two upper and two lower, then across the aisle at a ninety degree angle are two more sleeping platforms, one upper and one lower. As often happens among strangers thrown together in close quarters for a length of time, a sort of informal camaraderie develops, a “we’re all in this together so let’s try to get along and make the best of it” mentality. People play cards to pass the time, they eat, they drink, and for the most part everyone you encounter is courteous and friendly. On this particular journey, I had unfortunately come down with a nasty head cold the day before in Yalta, and by the time we’d made the two hour bus ride from Yalta to Simferopol and boarded the train, my misery was full-blown: stuffed-up head, sore throat, muscle aches and general fatigue and wanting nothing more than a long, hot soak in a tub and to sleep for ten hours. In one sense, however, I felt quite fortunate to have the head cold as my sense of smell was considerably dulled and if there’s one thing you don’t really want to have your nose in perfect working order for, it’s the smell of fifty-four people all taking off their shoes and socks and most of their clothes when it’s bedtime and no, there is no shower on board. Add to that the odor of the toilet if you’re unlucky enough to be seated near either end of the car, plus whatever your friends and neighbors brought on board to eat, and things can get a little ripe in there, especially with the standard lack of ventilation. None of the trains I’ve traveled on are air-conditioned and sometimes the windows are openable and sometimes not. My wife and I were traveling with her son but the three of us were not seated together because we’d gotten our tickets too late. I found myself next to an older Ukrainian gentleman who wanted nothing more than to engage me in some conversation in his very broken English and to share with me some of his samohon, which is homemade vodka or Ukrainian moonshine, as I call it. And I would have loved to partake in both, but feeling like I’d been run over by a bus put a real damper on my interest. I didn’t want to eat, drink, talk or do anything except sleep, which turned out to be the one thing I could not do. When I was a much younger man, many many moons ago, I could sleep through an atom bomb detonating. Now, if my bedroom window is open, the first robin at dawn chirping in the tree outside wakes me up. By the time darkness fell and the interior lights were dimmed, judging by the assorted snores, wheezes and deep breathing exercises I heard, most of the folks pretty quickly drifted off to slumberland. Add to that the overall racket of the slamming, jostling, squealing train – I was certain either the rails were coming apart or the wheels were flying off about every five minutes – I slept a grand total of, oh, maybe fifteen minutes all night. That’ll sure make you feel chipper in the morning. My second plascart experience proved not much better, even though my health was fine this time around. We’d bought our tickets too late and all the coupe cars were sold out, so despite my misgivings, we had no choice but to go plascart again. I did sleep a bit more this time in tiny five or ten minute increments, no thanks to my carmates. Some time in the middle of the night I awoke to a horrific sewer-like/filthy sweat sock smell. I looked over at my wife and we made “ewww” faces at each other, then after a few minutes the odor faded away. I’d just drifted back into a twilight zone of semi-sleep when someone’s cellphone went off. An older woman one compartment up and across the aisle from me answered it, talking in an everyday tone of voice that seemed abnormally loud given the fact fifty other people were trying to sleep! She spoke for several minutes and hung up. Then she and her husband conversed for a while, turned on the light above their beds, got dressed, pulled the sheets off their bunks, and dragged out their luggage. They then proceeded to sit there, apparently awaiting their station, for the next thirty minutes, talking to each other except for when they took turns yakking on the cell phone twice more, he in his rumbly baritone, she in a strident, hectoring voice. When at last they departed I thought, okay, now things will quiet down. Silly me. Little did I know they were just the warmup act and the main event was about to begin. It seems his stop was coming up soon and it’s the car attendant’s duty to get every passenger off at the correct station. Well, this guy was laying there in nothing but his underwear and short of lifting the dude and throwing him bodily from the train – which she looked entirely capable of doing – I didn’t see it happening. But the attendant was persistent and together with his buddy they managed to get him into a sitting position and drag a shirt over his head. All the while he kept repeating “Leave me alone! I want sleep!” As soon as the shirt was in place and they let go of him, he slumped over again. This pantomime continued for a good fifteen minutes. They would raise him up amid his lamentations, stuff a sock on one foot, again he would topple. It was like watching strip poker in reverse slow motion, except that he was passed out before the game started, which added an extra element of challenge. After a while, once I gave up on any notion of actually sleeping, it became a lot more fun, a sort of parlor game on wheels. What will keep me awake next? Will it be another drunk guy? Will the very large car attendant stampede past me again at runaway freight train speed? Will we make yet another stop in some land-that-time-forgot village where an entire troupe of circus clowns will come on board and perform for us? Eventually, between the two of them – literally – they did manage to get the drunk man off in time. He then stood outside on the platform for ten minutes howling at the moon with some buddies who were there to meet him and, from the sound of it, just as wasted as he was. In fairness and full disclosure, I must report that I’ve taken many train trips around Ukraine and this is the only time I’ve witnessed such a carnival of lunacy. My wife says I am very lucky (meaning unlucky) and that in her entire lifetime of traveling around Ukraine by rail, she has never encountered so much bad behavior and rudeness. I believe her, of course, but in the future, I’ll stick to the coupe car, thank you.